I went to the Antwerp Food Truck Festival last Monday. It was organized by Barrio Cantina and they moved around Flanders. So if you couldn’t get enough of a couple of days, you could travel with the festival to Bruges, Ghent, Antwerp or Ostende. I took my boyfriend and his best friend to Antwerp for this awesome event. Our first stop was at the Microbar. This foodtruck brought us… *hold your breath* … insects! Microbar had crickets on a stick, spring rolls with worms or a little jar filled with crickets and worms. We made one last stop because our stomachs were already beginning to get full. 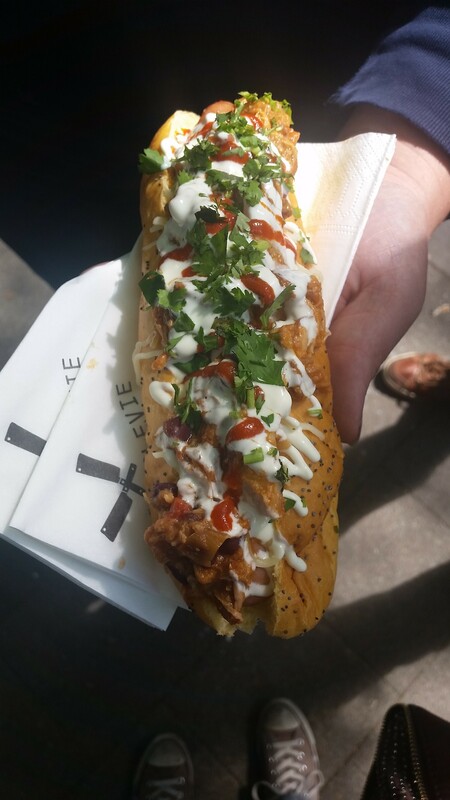 The boys went to a foodtruck with enormous hot dogs. I didn’t. You know me… I had to pick something sweet! So I went to ‘Ons Lucy’ to get myself a sweet Waffle on a stick with chocolate and sprinkles! Yumm! I’ve heard that insects will be part of the diet of the future because they fit into what some say the future of food production looks like. I’m glad to hear that you liked them. Indeed, one day we’ll all be eating insects because it’s healthy and because there will be nothing else to eat (so they say). Woot! Look at you, ahead of the curve! Barrio Cantina, zoveel lekker eten! Ik was helemaal weg van de hotdogs. Die quesadillas en die wafel zien er ook heerlijk uit. Ik krijg het water in de mond, haha. What did you think of the spring roll?